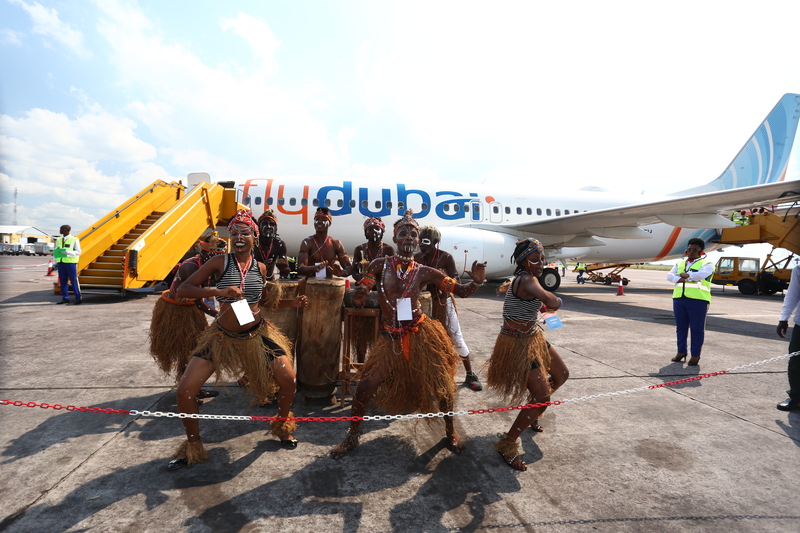 DUBAI, UAE, 2018-Apr-18 — /Travel PR News/ — Dubai-based flydubai’s inaugural flight touched down yesterday at N’djili Airport (Kinshasa International Airport – FIH). flydubai will operate daily flights to N’djili Airport with an enroute stop in Entebbe.flydubai is the first national carrier for the UAE to create direct air links to the Congolese capital, Kinshasa and with the start of the service sees its comprehensive network in Africa grow to 13 destinations in 10 countries. With the start of flights to Kinshasa another gateway is opened up for passengers from the GCC, Russia and the Indian Subcontinent into Central Africa. Passengers from Kinshasa have access to more than 90 destinations on the flydubai network and through its codeshare partnership with Emirates can connect easily and conveniently to Emirates’ destinations spanning six continents in over 80 countries.The inaugural flight touched down at 14:20 (local time) and on board was a delegation led by Sudhir Sreedharan, Senior Vice President, Commercial Operations (UAE, GCC, Indian Subcontinent & Africa) for flydubai. The delegation was met on arrival by Mr. Tshiumba Pmunga Jean, Director General, Civil Aviation Authority, Mr. Kufula Makila Rex, Cabinet Director, Minister of Transport and Mr. Constant Bopima Moelo, Cabinet Director, Minister of Tourism. flydubai will codeshare this route with Emirates, offering all passengers the benefits of this partnership, including travel on a single ticket and increased connectivity with more choice to travel and access to Emirates’ destinations spanning six continents in over 80 countries. From its home in Dubai, flydubai has created a network of more than 100 destinations and over the next decade the airline will see its fleet grow by up to 296 aircraft. Since commencing operations in June 2009, flydubai has been committed to removing barriers to travel, creating free flows of trade and tourism and enhancing connectivity between different cultures across its ever-expanding network. Enhancing connectivity: Carried more than 50 million passengers since it began operations in 2009. This entry was posted in Airlines, Airports, Flights, Travel, Travel Services, Travelers and tagged Entebbe, flydubai, Ghaith Al Ghaith, Kinshasa, Mr. Constant Bopima Moelo, Mr. Kufula Makila Rex, Mr. Tshiumba Pmunga Jean, Sudhir Sreedharan. Bookmark the permalink.